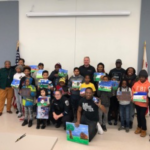 Code 3 sponsored the “I Have A Dream” Art Contest, on Martin Luther’s Kings birthday. 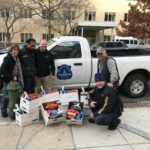 This was all hosted at the 6th Police District in Washington, D.C. We were moved to see twenty-five children from local schools paint their dreams out on a canvas. Supplies were provided by a local artist, who gave the children a brief art lesson and all materials needed to complete their painting. We handed out a 1st, 2nd and 3rd prize along with participation gifts for all of the kids. The winning portrait was painted by a ten-year-old who painted Caucasian, Hispanic and African American children holding hands looking up to the sun. In light of Martin Luther King Day, the event was very moving.